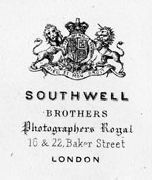 Southwell Brothers, Photographers Royal; History of the Business. One copy may be printed or saved for the purpose of personal private research only. No further reproduction of any part of this document is permitted without the express permission of the author.